One of the services we offer that really separates us from our competitors is the ability to tie-in additional promotional collateral and messaging to your incentive or rewards program. We believe that when fulfilling a reward there are new opportunities to get in front of your customers and drive additional actions. In addition to the branding of your prepaid rewards card, we offer the following marketing add-ons. Each prepaid reward card is affixed to an 8 x 11 sheet of paper called a carrier. We include our default carrier with the OmniCard logo on it for free. For a small fee you can fully customize the look and feel of your own carrier to better display your brand and provide additional offers you may want to communicate to your recipients. Pricing is based on quantity per order. The larger your order, the lower the price. full page (8 1/2 x 11) or as Buck Slips. 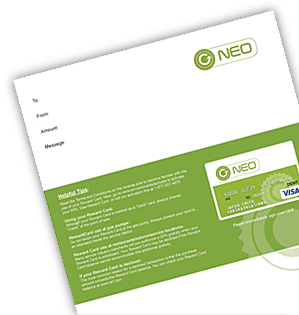 Promotional inserts also require that you have an approved CoBrand Card with OmniCard. Pricing is tiered per order based on quantity. Set up time is usually 1-2 weeks. 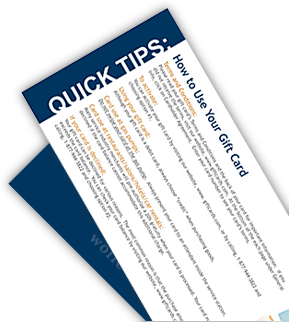 The inclusion of custom inserts may add up to 2-3 additional business days to fulfill your prepaid card orders. There are two standard insert sizes we support. Download the specifications for each here.